Good sources of inventory aren’t just lying out in the open for everyone to see, you have to go looking for them. 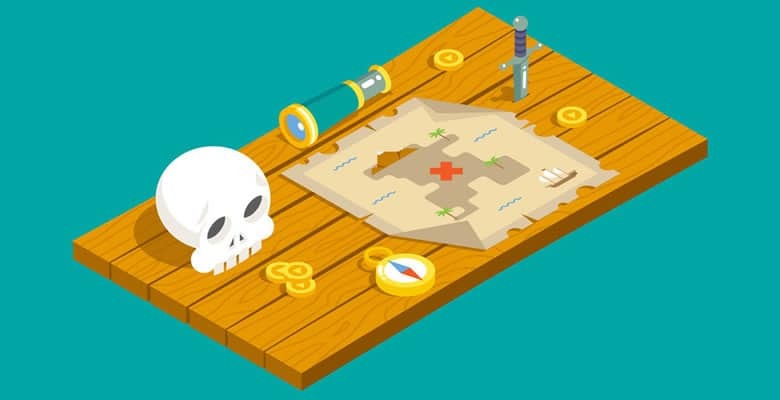 But the quest to find profitable products is not easy – it’s almost like searching for buried treasure. First, you’ll need some sort of map to guide you, rather than just wandering around at random. But don’t expect to have an X marking the perfect spot. You’ll also need “pieces of eight” to invest. The more gold doubloons you have at your disposal, the more options and leverage you will have with suppliers. Then you’ll need the right tools for the job. A compass and telescope won’t get you far, but there are software and services available that can help a great deal. In this post I’ll walk you through the Product Sourcing category of the Web Retailer directory. It covers market research, product evaluation, importing and private label, online arbitrage, wholesale, liquidation and dropshipping. But first, why all the focus on sourcing? There are several reasons. Online marketplaces are incredibly competitive, so it’s not enough to find just anything to sell. The intuition that popular products will be good sellers couldn’t be more wrong – usually the most popular items turn out to be the most competitive and least profitable. You’ll need to find quieter waters for your business to stand a chance. Also, inventory is the greatest cost in this business – along with the sale price it defines the gross profit for every item you sell. Finding the right products and suppliers, and getting discounts, bulk deals or some extra flexibility in payment terms creates a stronger and more profitable business for you. Whichever ecommerce business model you follow (private labeling, arbitrage, wholesale, dropshipping etc), having the best tools for the job – and using them well – can set you apart from your competitors. You make your money when you BUY not when you SELL! I hear advice all the time about checking the market pricing to determine the buy pricing. But there is a business principle that I adhere to that is, if you spend time to negotiate and buy at the right price you will have greater success. Learn the art of good negotiation, it pays well. What tools and services are out there for product sourcing? Market research tools provide easy access to data from online marketplaces including Amazon, eBay and Etsy. Marketplaces are designed for buyers, not sellers. The navigation options and data filters in a good research tool allow searching in ways that are not possible (or would be very laborious) using the marketplace directly. Research tools can include features that don’t exist on the marketplace, such as competitor analysis or algorithms to help find profitable niches. Research tools can provide data on sales volume and pricing, either estimated or actual. And that is probably the “killer feature” for market research tools: accurate sales data. Amazon and eBay have an amazingly broad selection of products, so there’s every chance that a product you are considering is already being sold. There’s no better indicator of how many you could sell than how many have been sold in the past. Unless you have deep pockets, good sales data is hard to come by. We use Terapeak for historical eBay data, as well as Amazon’s best sellers lists and the Google Shopping Assortment Report – a list of the most popular products in your category that you aren’t advertising yourself. We use all three tools to investigate products we may want to stock. But the only way to be sure is to buy a small quantity and try it out. We have sometimes been very surprised at what sells. Useful as they are, market research tools are only part of the puzzle for successful sourcing. They aren’t going to be much use if you are starting with a completely blank slate – you need to put something into them to get some results back. If you are starting from scratch, take a look at our archive of sourcing posts for ideas, including finding a niche, Amazon product finders and profiting from trending products. And as Trevor Ginn says above, the data from these tools is only an indicator of your potential sales volume. Your actual sales could be on a completely different level, in either direction! Browse the directory for Market Research tools, including reviews, news, related discussions, compatibility information and pricing. Current listings include Jungle Scout, Terapeak, BigZata, MerchantWords and ZonGuru. Product evaluation tools provide listing and sales data from online marketplaces. If that sounds a lot like the market research tools above then you’re right, they both provide access to similar data. But there’s a key difference: while market research tools are driven by free-form searching and filtering, product evaluation tools are driven by “looking up” specific products in the most efficient way possible. There are two main types of product evaluation software: mobile “scouting” apps and list upload tools. Mobile scouting apps are a necessity for some sourcing models including retail arbitrage and selling used books. Examples include Profit Bandit and ScanPower. These apps scan the barcode of physical products then display the potential selling price, fees and resulting net profit. The best tools, when properly configured, are very fast and allow sellers to evaluate hundreds of products in a single sourcing trip. Instead of scanning physical items, list upload tools are designed to process a whole spreadsheet of products – typically the entire stock list of a manufacturer, wholesaler or liquidation company. After uploading the list, the software researches each product and adds data on selling price, sales volume, fees etc. Why would you want to do get data on hundreds or thousands of products at once? One scenario is to find a few profitable items within a stock list of thousands. Another is to evaluate a supplier as a whole, to see if they are a good company to develop a long-term relationship with. Either way, getting all the data in Excel allows you to add your own custom calculations and filtering, and make more informed decisions. Most sellers don’t plan on selling a single product the rest of their life, so why select a supplier based on one product? Sure, start with a few suppliers that have a product you really like, but then look deeper into their overall offering. Get your first product from a vendor you can grow along with, because they have many interesting products. It may cost you slightly more to start with, but that will be peanuts compared to all the time and effort you save in sourcing your second, third and fourth products because you have already created that relationship. Most product evaluation tools only use data from Amazon. The product catalog underpinning Amazon’s data makes it a relatively reliable source for matching product codes (UPCs, EANs, ISBNs etc.) to listings on the site. Two notable exceptions that use eBay data are mobile app Swank and list upload tool Assortify. Browse the directory for Product Evaluation tools, including reviews, news, related discussions, compatibility information and pricing. Current listings include Profit Bandit, Unicorn Smasher, ScanPower and Scope. It’s no coincidence that importing and private labeling are two of the most popular topics on the Web Retailer blog. In the directory, we list importing tools and services that are a great fit for the needs of online sellers. Wherever we can, we only list services run by people who are deeply knowledgeable about key topics such as the Amazon marketplace and private labeling. Supplier and product directories such as Global Sources. Sourcing agents and consultants such as IMEX Sourcing. Supplier marketplaces and comparison sites such as freight marketplace Freightos. We don’t try to replicate other directories by directly listing manufacturers, trading companies, quality inspection companies or freight forwarders. While third-party tools and services can be a great help with importing, they are no substitute for direct contact with suppliers. Get face to face with the supplier, and get your hands on the product. It’s easy to look at stuff online, but hard to determine the quality. So much time can be wasted deliberating and going back-and-forth on email. What are the benefits here? You see the product before the deal is negotiated and learn more about your supplier in five minutes face-to-face than you do in dozens of email exchanges. Your supplier will also take you more seriously. Browse the directory for Private Label & Brands tools and services, including reviews, news, related discussions and pricing. Current listings include Global Sources, IMEX Sourcing Services, 80/20 Sourcing, and Alibaba.com. Online arbitrage means buying products from an online retailer (or marketplace) to sell through another online marketplace. For example, products might be bought from Amazon to sell on eBay. Usually, the products are purchased only once a sale has been made and then shipped direct to the buyer. This makes it a very appealing model as there is no need to handle stock and little upfront investment. Perhaps not surprisingly, online arbitrage has become a buzzing topic for those looking to generate an income working at home. At Web Retailer, we’ve published two very popular posts about tools for online arbitrage and the unique phenomenon of Amazon-to-eBay arbitrage. Help find profitable arbitrages (an arbitrage is a profitable combination of product, source retailer and target marketplace). Help automate the process, with features such as automatic listing and price updates on the target marketplace, and automatic ordering from the source retailer. What’s the catch? Well, online arbitrage is very competitive, so sources often run dry quickly and selling prices can fall dramatically. The process of finding arbitrage opportunities can be extremely time-consuming, and result in little profit. Even so, with skill and the right tools online arbitrage can certainly be profitable, but for most people it is unlikely to grow beyond a hobby business. Browse the directory for Online Arbitrage tools, including reviews, news, related discussions, compatibility information and pricing. Current listings include Tactical Arbitrage, BuyBotPro, SourceMogul, OAGenius and FBA Wizard. This category covers two of the more conventional and longstanding product sources for online retailers – buying existing products (often branded items) in bulk from other businesses. As for the importing category, we don’t directly list wholesalers of new products or retailers who have clearance stock. Instead we list wholesale directories, and liquidation companies who specialize in selling to traders, or have an easily accessible marketplace for liquidation products. Note that we are using “liquidation” in a broad sense here: products that were originally intended for sale through ordinary retailers, but for one reason or another are now being sold off in bulk at a substantial discount. Those reasons can include customer returns, overstocked product lines, and the inventory of bankrupt businesses. Albert Palacci’s guide to the liquidation business provides a lot of insights into how this industry works. Building up personal relationships with key staff members and national sales managers of top brands and clearance houses was key to our success in sourcing clearance stock. Goods from bankruptcies in the sportswear industry tend to go straight to the administrators, but once you have a presence on Google they tend to come looking for you rather than vice versa. Sourcing end-of-line and clearance stock requires heavy investment both financially and personally with your suppliers, and we prefer to work closely with a few of them so that we increase our spend and hopefully get priority treatment over other buyers. Sourcing from wholesale and liquidation sources may seem messy and unglamorous compared to importing, arbitrage and dropshipping, but it’s really just another sourcing model that can be equally as effective as any other. It certainly has its challenges, not least Amazon’s increasingly draconian policies for sellers of branded goods. But sellers who follow this model, and learn to be skilled buyers and business operators, can succeed just like those who use different strategies. It’s all down to experience, knowledge and execution. Browse the directory for Wholesale & Liquidation websites, including reviews, news, related discussions, compatibility information and pricing. Current listings include 888 Lots, Worldwide Brands, BULQ, BoxFox and Liquidation.com. Like online arbitrage, dropshipping is a sourcing model that has a lot of buzz around it as a low-investment way to generate an income working at home. There are other similarities with online arbitrage: products are purchased only once a sale is made, and are then shipped direct to the buyer. There is no need to handle stock or invest heavily upfront. However, the key difference is that dropship sources are not retailers, they are business-to-business suppliers such as wholesalers, distributors and manufacturers. They just provide a direct delivery service so their customers (online and offline retailers) don’t have to purchase stock in advance or arrange shipping themselves. Despite the hype, dropshipping is not a new practice. It has been used for decades to sell products which are large, expensive or made-to-order. Furniture is the classic example. It’s very common for furniture retailers, whether they are online or bricks-and-mortar, to hold little stock themselves and instead pass orders directly to their suppliers for fulfillment. What is new is the increased availability of dropshipping for all kinds of products, not just those where it makes more sense logistically. A key challenge for dropshipping is the low barrier to entry, which leads to high competition and low margins. As dropship directories and marketplaces are easily available to all sellers, successful dropshippers usually have to build their own direct relationships with manufacturers. When researching new products to drop ship, first look at where those products are currently being sold. If you find retailers that typically use the drop ship business model, you can infer that the manufacturer has the capabilities. Then go to the manufacturer’s website and look for links that mention “drop shipping” or “wholesale.” But at the end of the day, the best way to learn if a manufacturer can drop ship is to hop on the phone and directly ask. Not every manufacturer supports the drop ship business model, which limits your ability to sell particular products. Connor Gillivan, Chief Marketing Officer, FreeeUp.com and author of ConnorGillivan.com. We list dropship supplier directories and dropship automation tools, which help sellers connect their systems to individual suppliers – a key challenge for those who have direct relationships with manufacturers. Browse the directory for Dropshipping tools and services, including reviews, news, related discussions, compatibility information and pricing. Current listings include Inventory Source, Dropship Direct and Doba. Whichever product sourcing strategy you use, there is a place for tools and services to help you research and evaluate products, identify suppliers, and work through the whole sourcing process. But software tools are not a silver bullet for sourcing inventory. You’ll also need your own skills and experience to make the most of them, and find unique opportunities that set you apart from your competitors. Notify me of comments by email. You can also subscribe without commenting. Ecommerce Inventory Management Software: Demystified!